Health literacy came up quite a bit during this tweetchat, how we reach marginalised voices in research and how we involve patients and their families in research (questions, designs, protocols etc). Healthcare researchers need to go to the patient, stop making patients come to healthcare researchers! Having patients and their families as an essential part of that interdisciplinary team and using branding were seen as key points for patient recruitment. It also encouraged others to host their own tweetchat on rare diseases! @GordonHill1 & @SRNCN1 & @IACRNUKandIRE hosted a tweetchat on ‘Exploring the Relationship between CRN/Ms & their Nursing/Midwifery Colleagues’ ​This started lots of conversations! Main tweets on where on the benefits of having a relationship between CRN/Ms and their nursing/ midwifery colleagues and how to support these relationships and grow them. @sharon_kempson started Wednesday with ‘Increasing Recruitment in Paediatric Research’ This is a topic close to my heart! And lots of topics were discussed including MDT relationships for increasing recruiting, how to involve children in research, parental consent and child assent and training for paediatric research staff. @ClinEdge & @AskGuideStar & @BTC_Network hosted ‘Budget Negotiations & Financial Management in Clinical Trials’ www.symplur.com/healthcare-hashtags/whywedoresearch/transcript/?hashtag=whywedoresearch&fdate=5%2F16%2F2018&shour=7&smin=0&tdate=5%2F16%2F2018&thour=8&tmin=5 ​What I found interesting about this tweetchat was how much interested it generated from research staff who are not involved in financial management but from the questions asked during the tweetchat they are now looking at how to become more aware of the structures etc involved in budgets. @VickyLShepherd hosted the a tweetchat on ‘Research Involving Adults Who Lack The Capacity To Consent’. Brilliant tweetchat that discussed how healthcare researchers can address the exclusion of those who lack capacity to consent and the legal and ethical issues to consider. One of the biggest learning points for me was who can make decisions, for research participation, for those who do lack the capacity to consent. @TinkleLin started the tweetfest on Thursday with ‘Research into Social Media as a method of Consent for Contact (ContactME-IBS)’ www.symplur.com/healthcare-hashtags/whywedoresearch/transcript/?hashtag=whywedoresearch&fdate=5%2F17%2F2018&shour=4&smin=0&tdate=5%2F17%2F2018&thour=5&tmin=5 ​Unfortunately I missed this tweetchat but read through the transcript I was really interested to see how much social media reached out to people who did not know that there were research studies they could take part in if they wanted to. They then shared the information with friends and family! @carmenvillarb hosted a tweetchat in Spainish! ‘How Can We Improve Collaboration in Research?’ Unfortunately I don’t speak Spainish but this tweetchat lasted close to 2hrs and this morning I could still see the conversation was still going on! 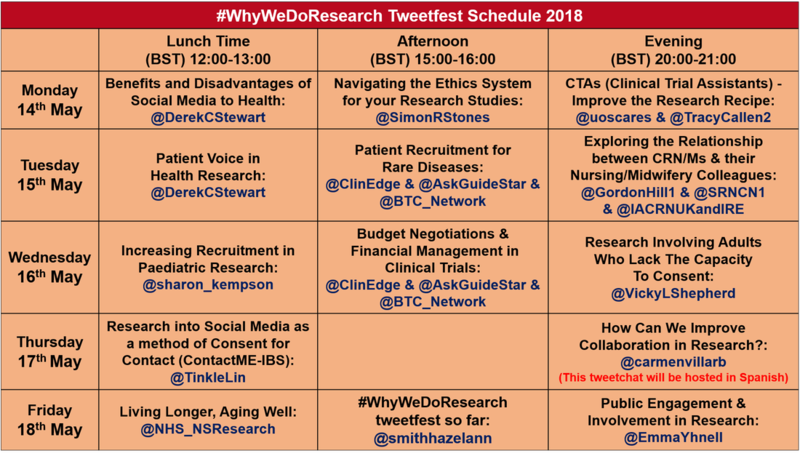 Most of the tweetchat was under #WhyWeDoResearch but I did notice some tweets used #WyWeDoResearch (so for the Spainish tweetchat look out for both). @NHS_NSResearch & @PwSiobhan hosted the first tweetchat for Friday with ‘Living Longer, Ageing Well’ This tweetchat raised some interesting points the need for a more inclusive and MDT approach to research examining longevity, the impact of co-morbidities on living longer, how research impacts on patients and on how well we implement research findings into practice.